The Department of Health MSH project has been running since July 2014. 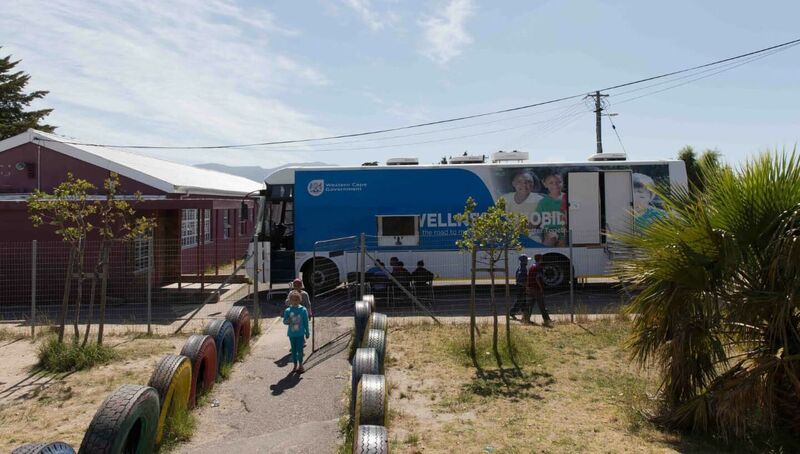 We supplied the Western Cape Department of Health with five Wellness Mobile clinics, targeting rural schools as well as learners in the Cape Town Metro. The five mobile clinics all have medical rooms consisting of optometry, dentistry and primary healthcare. The Department took on to lease these mobile clinics for a period of 10 years. All the rooms are fully equipped with state of the art equipment that enables the medical professionals on board to perform comprehensive health screening. All the rooms have their own computer and a server loaded with our on-board Healthpoint software which enables patient file management and reporting. The mobile clinics are each able to screen three children simultaneously. The MSH Operator collects a small handful of learns from the classroom at a time to keep disruption to the school to a minimum. The children are seated under a gazebo and watch an educational movie on the TV screen on the outside of the mobile clinic while being registered and waiting their turn to enter the clinic. Three of the mobile clinics are allocated to the rural districts of Cape Winelands, Overberg/Central Karoo and Westcoast. The other two of the clinics are dedicated to the Cape Metro. In this partnership MSH undertakes the maintenance and operations of the mobile clinic and the Departments’ medical professionals work on the mobiles. The Department of Health MSH project mobile clinics are soon due for a refurbishment after operating for three years. An exciting project to focus on preventative oral health by applying fissure sealants for and education is underway. With input from the Faculty of Dentistry of the University of the Western Cape, the plans for the new layout of the mobiles is being reviewed. Partnerships are being developed to assist the Department of Health in staffing these mobiles with dedicated oral hygienists.